Sailing into the wind – why would anyone do it? My grandmother fondly refers to me as her little bird, flitting from branch to branch and migrating with an inbuilt instinct. Perhaps this translates to our sea life as we are nomadic sailors, exploring the globe however the seasonal or Trade wind dictates. I guess that’s the best way to describe the grand plan, although anyone who knows me understands my plans are often scratched in the sand of a beach with a rising tide. Trade winds are amazing. 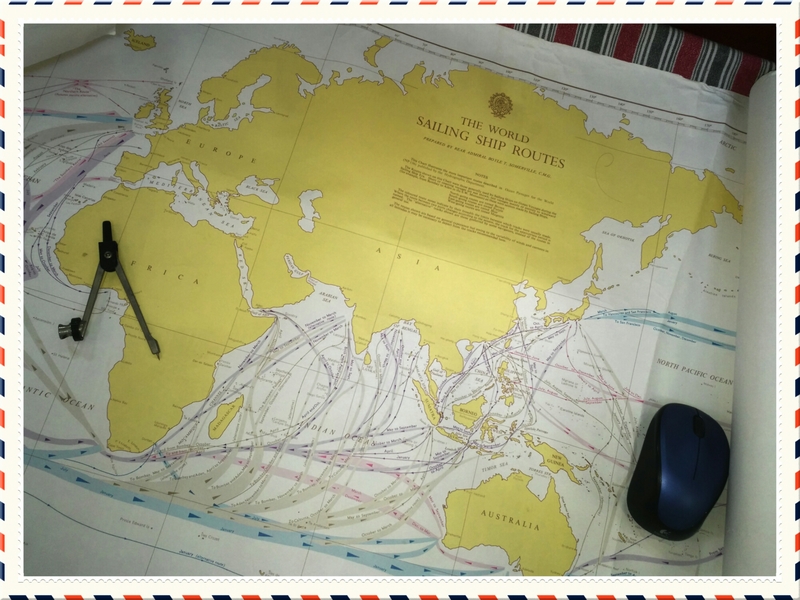 We purchased a beautiful chart of the tall ships trading routes which inspired dreams long before we moved aboard Tiki and has become my go-to map when dream planning our global course. Normally we would be sticking closely to these seasonal highways, after all we are nomadic and want an easy cruising life. But sometimes we go against the wind, turn on the engine and reverse course. Why? Not us we’re going south, motoring not only into a headwind but a 2-3knot opposing current and swell. It seems like madness and after a few nasty passages into wind through Indonesia Captain Crackers and I looked each other in the eye, spat on our palms, shook and swore never again! yet here we are. Ahh but this time the madness has an olive grove gold and mountain peaked silver lining. This time I’m not complaining at all. Because this time for all the queasy seasick, thumping discomfort associated with this beat to wind sea leg there is a huge reward at the end. We are off on a land based awesome adventure in the form of GR11 hiking in Spain, woo hoo! So why am I sailing south into the wind? In boatlife any long departure from our salty home means Tiki needs to be looked after in a secure yard or marina. Mediocre ones simply offer a pontoon to tie to. A good one in addition has security, will check her mooring lines, watch her waterline, listen for alarms and tie down anything which works itself loose in a storm. Tiki is my home, she’s got soul, I talk to her, we’ve got sand-scratched plans. She HAS to be in a good one and unfortunately there isn’t a big choice in this area, so back south towards Singapore we go. Sailing into the trade winds? Normally would never recommend it, but this time it’s all good and the distances not too far. The real beauty of the trades to this nomad is that they will be here around the same time every year so my sand scratchings are free to follow them when we return. Tiki showcase, a set on Flickr. Everyone has been asking for some more Tiki Pics so here she is – enjoy! Setting off from the anchorage the wind was light and right behind us, the sun was setting gloriously in front of us – what better time to trial the new parachute sail? We obtained a standard 28ft ex-army parachute from the US and set it up for the first trial sailing by dividing the lines equally and tying them off onto two steel rings. One ring was attached and raised on the spinnaker line towards the top of the mast. The lower end was attached to a line and ran it through a shackle on the bowsprit then back to the cockpit. The results were fantastic! Without a breeze to mention we were being gently pulled along at just under 3 knots. The type of breeze from behind and changing direction that would require lots of work using a spinnaker or any other poled sail was a wonderfully relaxing event with the parachute. We both lay on the foredeck with our arms folded behind our heads, looking up as the parachute changed direction with the wind as required – and it looks so peaceful. The current setup which requires some tweaking causes it to manoeuvre with a jelly fish like motion. Meaning the vertical sides accordion in and out and a bit of maths is required to calculate how to alter the various cord lengths between the top and bottom sections of the chute. We will adjust as we go to see the best setup – but a wonderful result for first trial.